We are shaped by our experiences, for better or for worse. Sometimes, in adversity, we get the chance to dig deep, draw upon all of our inner resources and in the process become a slightly better, more improved version of ourselves. 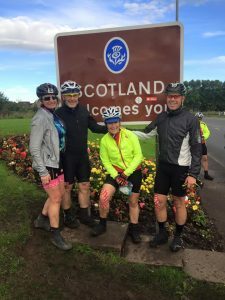 Well this was my thinking when I made the crazy step of signing up for the Deloitte Ride Across Britain (RAB) – a 969 mile cycle from Lands End to John O’Groats in just 9 days. I took up leisure cycling just 3 years ago, and in the beginning just a 20 mile ride would see me take to the sofa for the afternoon. Over time my stamina improved, but how was I going to turn myself into a lean, mean cycling machine pedalling away for 100+ miles a day. Was it even possible? I trained hard for the 5 months preceding the challenge. Not just on the bike, but I joined a gym and actually went along and used it too. I figured a variety of different exercise would be useful in avoiding boredom and also injury. In that space I came to love circuits, boxercise and even a bit of outdoor swimming; I dusted off my tennis racquet and enjoyed going to yoga classes rather than just teaching. In the middle of August I achieved my longest pre RAB distance on the bike – 600 miles over a 2 week period. I felt much stronger and fitter than at the start, had lost weight and felt really well. So, finally the day approached – 8 September 2017 when we took the train from Paddington to Penzance, and then a transfer to Lands End. The journey: Arriving at base camp was so exciting. The views were stunning and 800 riders were due to complete this awesome event. We were reunited with our bikes (which had travelled ahead by road), allocated our tents and then congregated in the big marquee for a delicious evening meal and to set the scene for the challenge ahead. Alas our timing coincided with stormy weather conditions created by the recent hurricanes across the globe. The winds whipped hard up against the tents, and the noise from the canvas billowing kept many of us wide awake. Not a good start! We had heavy rain showers and winds on 7 of the 9 days, which made the cycling much, much harder. You can see on the little map below the path we took, and the stops along the way. 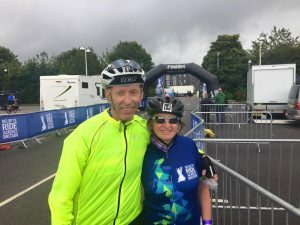 Battered by the elements: Many riders had completed this event before, and all were consistent that the weather conditions made it ‘brutal’ – the most difficult RAB so far in history. The organisers praised our commitment and stoicism in the evening talks. One particular night in Penrith saw the whole campsite including the marquee, under water. Due to the forecasted prevailing wind we were encouraged to work in teams when cycling the next day – by sitting close to someone’s back wheel. Called drafting, this gives an aerodynamic benefit which achieves a faster speed for less effort. By constantly rotating lead position you can all benefit. Our morning wake up call that day at 5:30am was Take That – Greatest Day which felt ridiculous (greatest day – really???) and also relevant (stay close to me). I cried a little with both terror and anticipation – were we going to blown over in front of traffic? Silly I know, but when you’re tired and emotional the mind plays all sorts of tricks. There were a few bright spots between showers so I guess you could say that the weather was mixed. Trouble is that once you get wet then things are just a little bit more grim. It also meant there was little opportunity to sit down at the breaks; instead we huddled together stuffing food down quickly, except in a few luxurious locations when there was a community centre available. This was rare. Crossing into Scotland: Early in Day 6 we crossed into Scotland which was a real milestone. What a distance had been covered! Scotland was beautiful and the weather was again mixed. To add to the wind and rain was a distinct drop in temperature. Fortunately I was able to wear layers and had a really good waterproof jacket; my biggest issue was wet feet particularly when setting off from Penrith. About 30 miles in I stopped at a little shop with fellow RABer Julie where we met Margaret & Janice who tried vainly to dry out my shoes with kitchen towels. 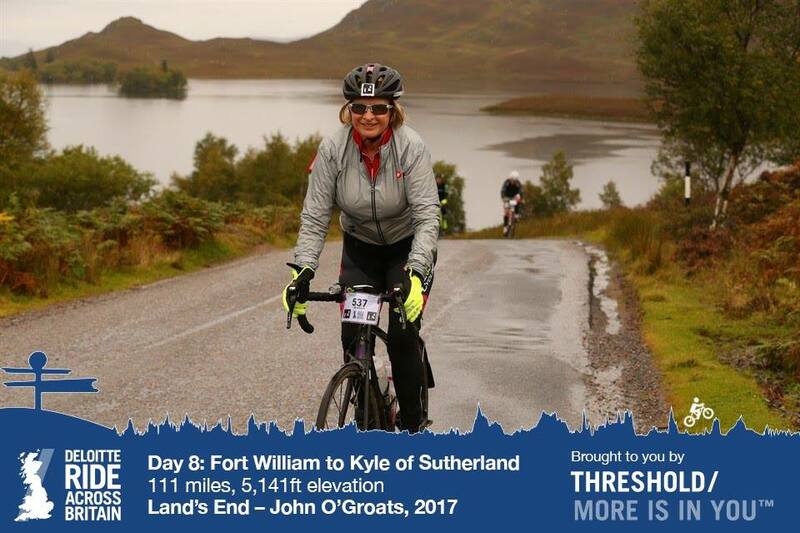 Unfortunately I didn’t cycle for 2 of the Scottish days due to a knee injury. One of these was the final stretch to John O’Groats when instead I headed back into Inverness with some fellow wounded ducks. Highs & lows: On the upside, a really hard challenge makes you very aware of the creature comforts you are so lucky to have in normal conditions. Never a bad thing. 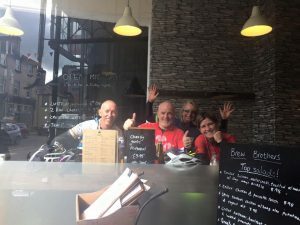 From a fundraising point of view, I raised £3.5k for the South Bucks Hospice who do a fantastic job of supporting people with life limiting conditions, helping them to maintain their best quality of life for as long as possible. I feel so humbled by all the people that supported me both with donations and also your lovely encouraging comments on facebook. Some of the most striking rides interestingly are also the most hilly – didn’t think I liked hills. But Cheddar Gorge, Shap in the Lake District and the climb alongside Loch Ness were stunning. And when you get to the top, there’s always lots of downhill to enjoy! I’ve also had the opportunity to explore the whole remit of success and failure. Clearly the easiest way not to fail is not to try, and I think many of us can be put off things by thinking we are not yet good enough. The way I reframed my disappointment at not reaching JOG was to think about what I had achieved – reach for the stars and get to the moon. Embrace failure to achieve success. 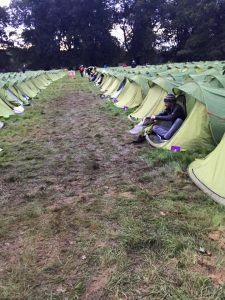 Last week in the midst of the ‘brutal’ conditions I would have listed lots of lows – most of which though arose from the weather. But even a few days is a healer and though I am absolutely not rushing to do this again, I can honestly say I’m looking back with some warm thoughts. Thank you to… Over the course of 9 days I met lots of lovely people. Nigel from Bermuda was my main ride buddy and we were a similar pace, fast downhill and slower on the climb. We helped pull each other along and distract each other from the monotony of rotating those pedals. Julie & Ian helped me with a wobble on the way to muddy Penrith and before the Shap climb. Come to a coffee shop, they said. Just what was needed. I met Michael at the top of Shap where we shared Mint Cake. After a soaking from freezing rain we pulled in for a coffee and got chased on our way by one of the chaperones, concerned we were taking too long. We absolutely blasted the last 18 miles – looking forward to checking that section out on Strava! My travel buddy and tent allocation fairy, Andy May. Getting in so late in the evening was tough and your help made it a little easier. And to Andrew for sharing a delicious lunch in Inverness when our colleagues were on the way up to JOG. So all in all a difficult but positive experience, and one I’ll remember for all eternity. Jenny Phillips is a nutritionist & fitness coach, helping people to achieve better health & happiness. Amazing ride, really impressive, thanks for sharing your experience Jenny. So proud of you – what an amazing achievement – well done !